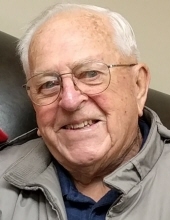 Philip Leo Baxter of Eau Claire, Wisconsin formerly from Marblehead, Massachusetts, his beloved seaport town, passed away on Friday, March 15, 2019 with his wife of 60 years, Pat Baxter at his side. He was born in Lynn, Massachusetts on October 21, 1924. He graduated from Marblehead High School then continued his education at Boston College. A year-and-a-half into his studies he joined the war effort. He served in WWII in the United States Navy as a tail gunner on a torpedo dive bomber. He returned to Boston College, graduating with a degree in Organic Chemistry in 1949. While attending, he was a member of the Chemistry Club and the Student Jesuit Society. After graduation, he became an active and contributing alumnus throughout his life. A gentleman in every way Phil had an unwavering dedication to helping others. He had great compassion and empathy, especially for those who couldn’t advocate for themselves. He took on many volunteer projects humbly and unassumingly. Along with other parents and some of his Milwaukee Elks Brothers, he founded the Eisenhower Center for people with cerebral palsy and other neurological disabilities. He was greatly loved by fellow board members, employees and clients. Phil was active in his Elks Lodge in Milwaukee and recently in Eau Claire for over 64 years. Ever part of the leather industry he was a past president of the Leather and Allied Trades Association, and lifetime member of the American Leather Chemists Association. He was the Midwest Sales Representative for Salem Oil and Grease Company in Salem, Massachusetts where his technical knowledge and expertise were highly valued and respected. Phil loved his work and considered himself blessed to have many lifelong colleagues and friends from all facets of the industry. Everyone appreciated and enjoyed his great sense of humor, infectious laugh and his gift as a natural born storyteller. When he was young he sailed, played hockey and high school football. He relished the camaraderie and was lucky to have lifelong friendships with many of his teammates. Phil and Pat were former members of Ozaukee Country Club and the Milwaukee Curling Club, they enjoyed many years curling together in Milwaukee and after retirement they curled with the Eau Claire Curling Club. His other love was golf and he continued to play with vigor into his 90’s. His private leisure included reading, crossword puzzles and advanced mathematics. He loved art in all its forms and sketched and painted, especially in watercolor. Above all he cherished his family. He was a devoted husband, exceptional father, grandfather and role model for all of us. He is survived by his wife Pat of Eau Claire; daughters Colleen Baxter and Nancy Stein and his son-in-law Charles Stein; grandchildren Michael Stein and his wife Lindsay Stein, David Stein; great-grandchildren, Hudson and Jacob Stein; sister Elyse Crisfield; dear cousins, Maryann Gahagan and Kathy Shanahan; other cherished relatives. He was preceded in death by his parents Ruth Naomi (McCarty) Baxter and William Leo Baxter; Phil’s children, Charles, Patrick and Cathleen; sisters, Ruthmary, Patricia, Paula and Anne; other beloved relatives. Having lost his mother at an early age he was brought up by his Uncle Charlie Cass who was like a father to him and his grandfather James McCarty. Phil had a deep faith and love for God and the Blessed Mother. He will be joyfully welcomed into heaven. Services on Tuesday, March 26th at Immaculate Conception Church, 1722 Highland Avenue, Eau Claire, WI 54701 Visitation 10:00 am, Funeral Mass 11:00 am, Luncheon to follow. "Email Address" would like to share the life celebration of Philip Leo Baxter. Click on the "link" to go to share a favorite memory or leave a condolence message for the family.